If I were only allowed to have one labor-market graph, these days I think it would be this one. Source: Catherine Rampell, NYT. 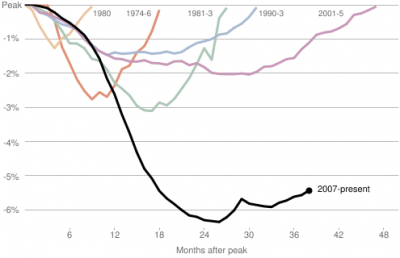 "Horizontal axis shows months. Vertical axis shows the ratio of that month’s nonfarm payrolls to the nonfarm payrolls at the start of recession. Note: Because employment is a lagging indicator, the dates for these employment trends are not exactly synchronized with National Bureau of Economic Research’s official business cycle dates."